Cape senior Ellie Garfield hangs up her cleats after this season. With the fall season behind us, we call a timeout and take a look back at Cape’s progress on the trails, the links, the court and the fields. Andrew Lupien’s runners looked excellent in 2016. His boys finished sixth at Regionals, then improved their performance on the larger, States stage, where they took fifth, back from Greely (first), Wells (second), Freeport (third) and Yarmouth (fourth). Jack Bassett, just a freshman, and Mac Huffard, a seasoned senior, were the squad’s two top runners across the season and at the Championship meets as well. Meanwhile, Lupien’s girls finished fifth at Regionals. Like their gentlemen counterparts, they upped their game a notch at States, taking fourth (back from Greely in first, Yarmouth in second and York in third). Camilla Grosso, a sophomore, turned in the outfit’s best times at both competitions, with Kelsey Kennedy, Emma Shedd and Liv Palma not far behind. The Capers say goodbye to a lengthy list of athletes in June, though only three – Huffard, Will Corsello and Kyle Long – come from the boys’ side of the action. Palma, Maggie Baker, Lily Bergh, Anna Friberg, Kate Ginder, Maggie Gleason, Zoe Johnson, Hannah Kobel, Elise Mullen, Katie Novak and Kelly O’Sullivan depart the girls’ roster. Seven seniors graduate the squad in June – Natalie Gale, Ellie Garfield, Julia Lennon, CJ Logue, Taylor Young, Kinnon McGrath and Katie Zacjkowski – but five current juniors will return for one final go-round in 2017, and a sizeable crop of freshmen promises good things even further down the road. Aaron Filieo’s group put together yet another standout season, running the first seven weeks of the regular-season table with ease. Specifically, the Capers never won by less than 23, and maxed out with a 57-0 blasting of G-NG. 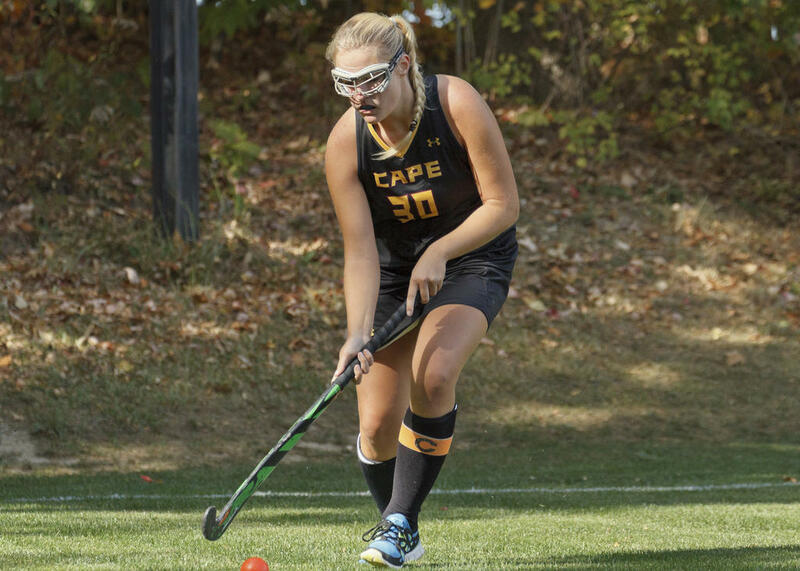 Cape’s final matchup before the bracketing arrived, vs. Wells, proved their toughest, and a preview of the C South Final. The Capers emerged victorious 13-7 from that first bout, but succumbed to the Warriors 27-14 when they met again a few weeks later. A substantial crop of senior leaders will say goodbye to the Cape gridiron, come June: Ben Ekedahl, Peyton Weatherbie, Marshall Peterson, Nat Spicer, Jeb Boeschenstein, Hunter Stephenson, Josh Powers, Brett McAlister, Camden Turner, Alex Depke, Max Woods, MJ Convey, Justin Harmon, Jacob Jordan, Nat Jordan, Roman Cloutier and Gustav Sonesson. Still, expect Cape to remain at or near the top of Class C in coming years; the program is simply too strong to nosedive. Chris Whitney’s oufit, perennially at or the near the top of the Maine high school golf-verse, put together an undefeated regular season in 2016, going 11-0. The Capers’ A Squad were team champions at the John Bapst Invitational, which included 15 teams from around Maine and took place at Penobscot Valley Country Club. The Capers B squad, meanwhile, finished fourth. Austin Legge, just a sophomore, shot an even-par 72 at the tournament, thereby winning the individual title, while Jack Kelley finished third, Lauren Schonewolf fourth, Max Altznauer fifth and Cole Spencer seventh. Cape combined to win their fourth-straight Western Maine Conference title, and Altznauer, a junior, claimed the individual title. Legge was runner-up to Altznauer for the honor, and both boys – along with Ryan Collins, Kelley and Chris Laprade – qualified for the Class B State Individual Championship. Schonewolf and Mia Spencer likewise qualified for the Class B girls state competition. Together, the team, last year’s State Champions, finished as this year’s runners-up. With the end of their season, seniors Hans Croft, Patrick MacDonald, Casey Cloutier, Cole Spencer and Lauren Schonewolf closed their careers as Capers. Ben Raymond’s boys posted another phenomenal run on the pitch, tallying an 11-2-1 regular season record to enter the tournament as the three-seed. The team notched key wins against other highly competitive teams like York, Greely and G-NG, though they could never quite figure out Yarmouth. Cape fell twice to the Clippers in the regular season, by one goal each time. Perhaps frustratingly, they never got a third shot at their longtime rivals: After a bye through the bracketing prelims, the Capers suffered a 2-1 upset to Greely in the quarters. Connor Flaherty, Jacob Allen, Matt Galvin, Owen Thoreck, Connor Thoreck, Wes Parker, Nicolai Sabbatini, Quinn Hewitt, Noah Bates, Elliot McGinn and Jon Fiutak all hang up their cleats for the team. Craig Fannan’s girls turned in a 7-5-2 regular season in B South, which featured a good deal of parity this fall: Any number of teams stood a solid chance against any number of other teams, and no team went unbeaten. The Lady Capers earned big wins over the likes of Greely, G-NG, Freeport and Kennebunk to enter the tournament ranked fourth. The outfit thus captured a bye through the prelims; in the quarters, then, they bested No. 5 Morse 3-0 to faceoff with No. 1 Yarmouth in the semis. Alas, the Clippers got the better of the Capers in the tussle, winning 3-1. Five seniors saw their time on the Cape pitch come to a close this fall: Caroline Coburn, Mariah Desachino, Caroline Paclat, Emma Schoonover and Erin Thibeault. Sarah Boeckel’s girls – State Champs in 2014 – battled a pretty even contingent of Class A competitors this autumn, going 8-6 through the regular season (including big Ws against the likes of Windham, South Portland and Deering) to enter the playoffs ranked 12th. They faced Mt. Desert Island in the first round, but ultimately fell 3-2 to the Trojans. Boeckel and her younger players bid farewell to just two seniors – Rose Punsky and Rachel Holmes – in June, suggesting the team can look forward to brimming over with experience in coming years. Cape’s Ben Ekedahl runs a route in his final high school game.